There are many different types of foundations available in the market these days. CC creme, mineral foundation, liquid foundations etc. The choices we have are simply boggling. It is not easy to decide on which one is more suitable for your skin type with the variety available. Since joining the Mary Kay family I’ve learned a lot from the seniors about the various types of foundations and which one is more suited for my skin type. Before choosing which formula works best there are 3 questions which you have to ask yourself. 1) What is your skin type? 2) What benefits are you looking for in a foundation? There are 3 main skin types for Asian women- Normal, Oily or a Combination of both. Living in a temperate country makeup may run easily due to perspiration. One needs to choose the correct type of foundation to enable the makeup to stay and last through the day. for Dry to oily skin which will make your skin glow and have a dewy effect. Infused with vitamin E and a blend of peptides, the result is skin that instantly looks firmer, younger and healthier. It’s the perfect age-fighting foundation for combination to oily skin, visibly reducing the appearance of pores, fine lines, wrinkles and skin imperfections. If you are not into a dewy look you can opt for the TimeWise Matte-Wear® Liquid Foundation instead. 8 benefits in 1 step- protects, color corrects, brightens, reduce redness,conceals, hydrates, reduces signs of aging and defends against skin-damaging free radical. It stays true and appears fresh for 12 hours, Heat- and humidity-resistant. Glides on as a lightweight cream to hide imperfections. Evens out skin tone, then dries to a soft, powdery, matte finish. I am personally using the CC Creme and Creme to Powder Foundation from the selection above. Here are my findings comparing the two different types of foundations. I use either the CC creme ( Very Light) of CTP foundation (Ivory 2) for my daily makeup as I run around a lot with my packed schedule. Both of them have excellent coverage and are very easy to apply. If I intend to do some contouring on my face so that my face will be more define for photo shoots I will use two different shades of CC creme ( Very Light and Medium- Deep) to achieve the effect that I am looking for. Comparing CC Creme to the CTP foundation. I find that the CTP has a lighter texture and much longer coverage then CC Creme. It doesn’t feel as oily on my face after wearing makeup for the whole day. The CTP foundation can be layered on easily to touch up your makeup throughout the day as compared to the CC Creme. The only drawback is that it is not that suitable for contouring the face if I want to achieve the Korean look for the day. Once you know which type of foundation is suitable for you, how then can you decide on the shade to use? To test out which shade was more suitable for my skin color I placed a swab of three different shades of TimeWise Luminous-Wear™ Liquid Foundation on my cheek to blend in. Ivory 3, Ivory 5 and Beige 3 . As I worked the colors into my cheek I noticed that Ivory 5 was the closest to my natural skin color and it was the color that I should select. Ivory 3 was too light ( made my face very white) while Beige 3 was too dark. It is recommended to blend in the colors on your jawline or on your neck as it will be the closest to your natural skin color and easier for you to achieve the flawless look. 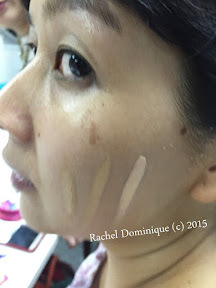 So do you know which type of foundation and how to choose the correct color now? 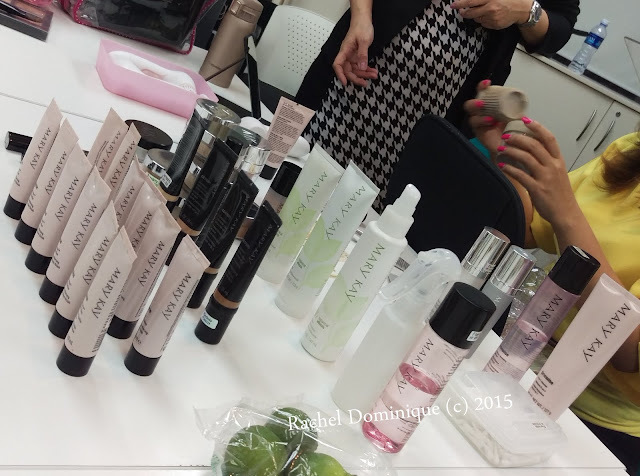 Disclaimer: I am an Mary Kay Independent Beauty Consultant based in Singapore. If you are interested to try out any of the foundations above do drop me an e-mail or a comment and I will schedule a meet up with you.